Nerdy Parents: Pass It Along! 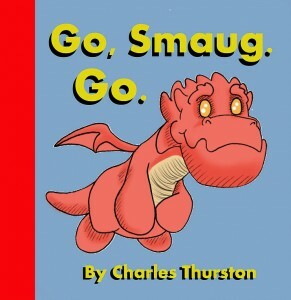 This is just too cute, so we’ll let the creator Charles Thurston explain it: “I have two small wonderful little girls and the problem I had was trying to find ways to entertain them and at the same time introduce them to the nerdy pop culture things that mommy and daddy love. There’s plenty of stuff out for small kids 6 and up but not for children under 4. So I decided to write and draw parody books for them that gave them a friendly introduction into the world of pop culture and sci-fi while paying tribute to the creative geniuses of George Lucas, J. R. R. Tolkien, Laura Joffe Numeroff, Joss Whedon, Rod Serling, Robert Zemeckis, Russell T. Davies, and Steven Moffat all of which that helped shape my childhood/adulthood and imagination.” Charles’ original hand-made books include titles like Go, Smaug, Go!, Taylor in Ape Land, and The Dire Wolf At The End Of This Book. All those and more are available as a package deal at his Etsy Store. You can also find out more at his web site, as well as look through his extensive collection of original prints for sale.